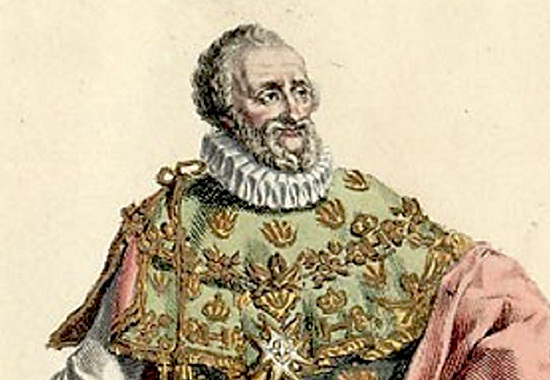 Henry IV was the king of France from 1589 - 1610. He was also called Henry of Navarre, or Henry of Bourbon. And here is more about the Bourbon family. As Henry III, Henry was the king of Navarre from 1572-1589. In 1593, Henry converted to the Roman Catholic Church, and ended the civil wars that had long desolated France. And here is the map location of Navarre, it's between Castile, Aquitaine, and Aragon. See also Governments of France. Here is a list of the men who acted as Controller General under Henry IV. Henry IV was assassinated on May 14, 1610, by a 32 year old and mentally disturbed François Ravaillac. Ravaillac, a former schoolmaster then lay brother of the Convent of the Feuillants (Reformed Cistercians), was convinced he could save the Catholic religion by assassinating Henry IV, who had planned military engagement against the Catholic Holy Roman Empire (over Julich). His campaign was scheduled to launch on May 19, 1610. On May 14, 1610, Henry went to visit his esteemed minister Sully, who had fallen ill. When Henry stepped out of Sully's house and was on his way to his carriage, Ravaillac emerged from a neighboring building and stabbed Henry twice. Henry was brought to the Louvre but died a few moments later. Ravaillac was quartered on the Place de Grève in Paris on May 27, 1610. Henry's wife was Marie de Medicis. Their eldest son, Louis XIII, became King of France on May 14, 1610.